It’s hard to believe the Star of David remained in plain view in the Islamic Republic of Iran more than four decades, on top of the Mehrabad International Airport in Tehran. 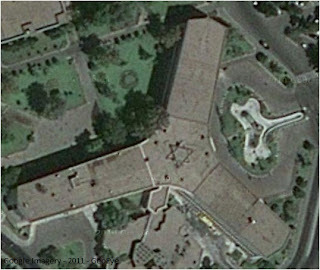 No one noticed until it was spotted recently in an aerial shot on Google Maps. 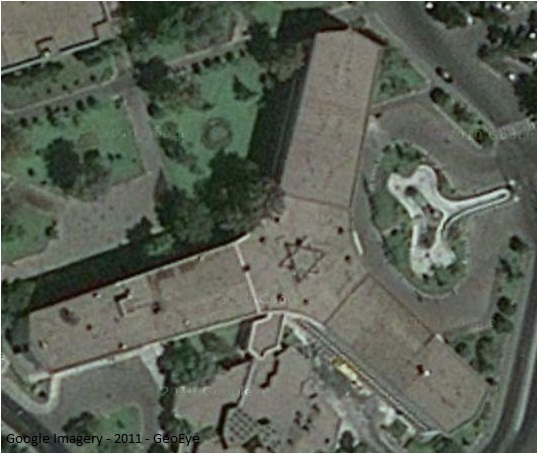 Apparently, Israeli engineers placed the symbol on the roof when they built the facility in 1955. Once alerted to the Jewish symbol, Iranian officials made plans – not surprisingly - to have it removed. Relations between Israel and Iran have been severely strained in recent times. Iran's nuclear production was set back about a year with the development of the Stuxnet worm, reportedly by the Mossad, Israeli intelligence. “According to the New York Times, the Stuxnet worm included one component designed to send Iran's centrifuges spinning out of control and another to record normal operations at the nuclear plant and then play them back so that everything would appear normal while the centrifuges were tearing themselves apart.”  Civilians on both sides would prefer cold wars to be fought with computer worms rather than bombs and guns. On January 16, 2011, the New York Times reported a joint U.S.-Israeli effort in developing a model of the Iranian nuclear process at Dimona, in the Negev region, laying the groundwork for countering Iranian nuclear production. There’s a lot of history in the Negev. Abram and Lot traveled from Egypt to the Negev (Genesis 13:1) and Moses sent spies into the Negev (Numbers 13:17). After 3,400 years, spies are back in the Negev. “Be on guard, so that your hearts will not be weighted down with … the worries of life, and that day will not come on you suddenly like a trap” and “The seed which fell among the thorns, these are the ones who have heard, and as they go on their way they are choked with worries and riches and pleasures of this life, and bring no fruit to maturity” (Luke 8:14 and 21:34). Each of us needs to ask a question: Am I weighted down with the worries of life or am I living with a view from God’s perspective? There's probably a star above we haven't noticed. Ewen MacAskill, “Stuxnet cyberworm heads off US strike on Iran”, guardian.co.uk, 16 Jan 2011.